Introducing the Cold Weather Start Kit by WhisperKOOL. This kit was designed exclusively for our split-systems where the condensing unit will be installed in extremely cold environments. 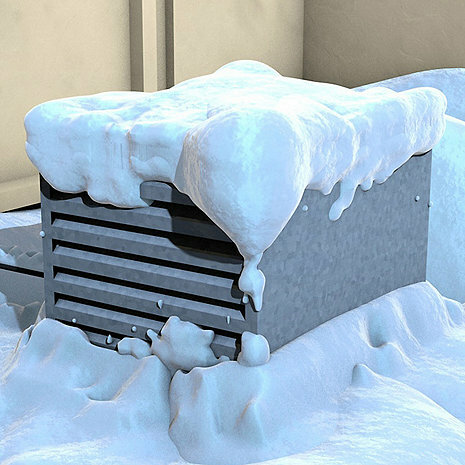 Our split systems are designed to be adaptable to almost any install, as the condensing unit can be located in a variety of locations such as a mechanical room, basement, back yard, or even a rooftop. Our split systems were designed to operate with the condensing unit exposed to temperatures between 20° F and 110° F. However, there are some areas in the country that may drop below 20° F. Due to these conditions WhisperKOOL designed the Cold Weather Start Kit. The Cold Weather Start Kit will bypass the low pressure switch on startup and keep the pressure in the system high enough to operate correctly for environments as cold as -15° F.
The Cold Weather Start Kit can be ordered as an upgrade on a new unit from the factory, or as an option for a unit already installed in the field, which comes with instructions to guide a technician through the install. If adding to a unit currently in use please contact a Wine Storage Consultant. Wine Enthusiast strongly recommends a full consultation with a Wine Storage Specialist before purchasing a wine cellar cooling unit. If the unit is returned due to an improper size, incorrect application or other non-warranty challenges, restocking and shipping fees will apply. Only compatible with WhisperKOOL Platinum Split Systems. For further descriptions and comparisons, please call 800.377.3330 for a free consultation with one of our wine storage specialists. Wine Enthusiast strongly recommends a full consultation with a Wine Storage Specialist before purchasing a wine cellar cooling unit. If the unit is returned due to an improper size, incorrect application or other non-warranty challenges, restocking and shipping fees will apply.